“Because I am evangelical, everyone thinks I have channels of communication,” said the pastor of the Presbyterian Church in Mhardeh. “Syrians believe the United States has the power to stop the conflict—if it wants to. President Vladimir Putin, recently reelected with evangelical support, “is seen as playing a big role to protect the Christian faith,” said Vlasenko, “and a sense of international brotherhood is deep within the heart of Russian Christians.” He emphasized the historic bond between the region’s Eastern Orthodox churches and the 19th-century Russian wars in their defense against the Ottoman Turks. One example is Sergei Riakhovskii, lead bishop of the Pentecostal Russian Union of Christians of Evangelical Faith. A member of several governmental councils to help convey the concerns of religious citizens, his church has forged strong connections with Syrian Protestants and organized several food convoys to aid the displaced. Vlasenko cited local polls which show two-thirds of Russians view the United States as their enemy. Evangelicals are more open, believing Americans want peace. But the US, viewed widely as an evangelical country, leaves them very confused. By contrast, Russian policy in the Middle East seeks to prevent the spread of radicalism, lest it spill over into its own Muslim citizens. Therefore, Russia sees itself as putting out fires—and expanding regional influence. Following President Donald Trump’s announcement to support Jerusalem as the capital of Israel, Moscow quickly offered to replace Washington’s role in brokering peace. But whereas a common Orthodox faith paves the way for good relations, American evangelicals have less understanding of traditional churches, said Salim Munayer, head of the Jerusalem-based Musalaha reconciliation ministry. Russians, meanwhile, engage Palestinian businesses in the pilgrimage sector. And Russia’s oldest NGO has revived its pre-Soviet investment in local schools through the Imperial Orthodox Palestine Society, founded in 1882. “Like local Christians, the Russians have real ties to the land, which they view as an icon—a place of veneration,” said Munayer. 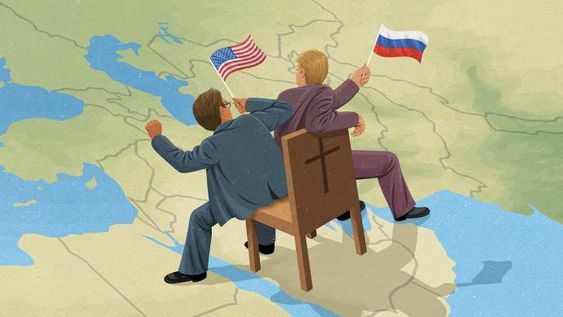 Russia, in many Christian eyes, is a balancing power to Israel-focused American interests, Munayer said. But local believers should not align too closely with either. “Otherwise, we will bind ourselves in the trap of political interests, getting manipulated by one side or the other,” he said. Like Munayer, Philip Madanat of Jordan believes local sentiment esteems Russian policy without buying the religious argument. It is the regime, not the Christians, they care about. But the evangelical specialist in religious movements sees another factor at play: cross-pollination. Thousands of Mideast Christians went to study in Russia during the Soviet era, he said. Madanat’s own uncle was secretary-general of the Jordanian Communist Party. They returned with esteem for the nation that enabled their education, and played key roles in Middle East business and political development. The children of this generation are now tuned culturally to America, he said, especially in Jordan with its strong US ties. But the fathers’ influence lingers, and has galvanized behind Putin’s charisma. Munib Younan agrees there is an emotional connection to Russia given its Syrian policy and American bias towards Israel. Recently succeeded as bishop of the Evangelical Lutheran Church in Jerusalem and the Holy Land, Younan stood with Middle East church heads to warn Trump not to move the US embassy. Outside nations have their own interests, while local Christians are an integral part of their people, he said. They need justice, not protection. Meanwhile, the struggle between outside nations—including Turkey, Iran, Israel, and the Gulf states—is tearing the region apart. Back in Mhardeh, Bitar asserts these people are looking for anyone to bring them peace. And if Russian evangelicals are right, this is the same desire of Americans. So within the soul-searching of Christian solidarity and cold geopolitics, Bitar, finally, can meet the assumption of his Orthodox neighbors.